Still, he was a king. Because of an accident of birth, he lived a privileged life in a palace, worse the finest clothes, and feasted every night, while his people lived in rude huts, worse corse cloth, and ate simple fare. But being a decent king, he always left the scraps from his nightly feast for any hungry peasants. Two potential provisions of this bill threaten to return us to the worst abuses of the Bush era. Read more about Reuters: "Obama voters, Muslims need not apply for gun course"
Read more about "Girl to get $10M for amputations after ER delay"
I came down for an hour or so yesterday, just to see what was what. Danced to the drumming for a bit, and the playful and gentle nature of some of what's happening here (drumming, dancing, art, communal sacred space, giant potluck meals) reminded me of some of Kery Thornley's "yin revolution" and "counter-games" ideas in his book Zenarchy. The Occupy movement is not just a protest, but an experiment and a demonstration of an alternative to the hierarchical socioeconomic systems that have dominated our thinking for centuries. I also ended up running into someone I knew years ago in Baltimore and fell into good conversation with her and with a high school girl she had befrended. Just hearing people's stories is also a big piece of what this is about, for as John Steinbeck wrote, "two men [or women] are not as lonely and perplexed as one". It's interesting how people react to the barriers the police have put up around the site. They don't completely enclose the space, you can move in and out freely, yet many people come up and stand on the other side watching, as if watching a parade or something. Perhaps a deliberate bit of police strategy to keep people from feeling like they can join or identify with the occupation -- establishing a boundary that takes a deliberate act to step across. So I invite you to cross it. Go down to your local Occupy group and join them, even for an hour. Cross the lines that the power structure sets up to keep us divided. When i first heard of the "Occupy Wallstreet" idea a few months ago, honestly, I thought it was silly, that about 20 people would show up. On this one, I am glad to be wrong. 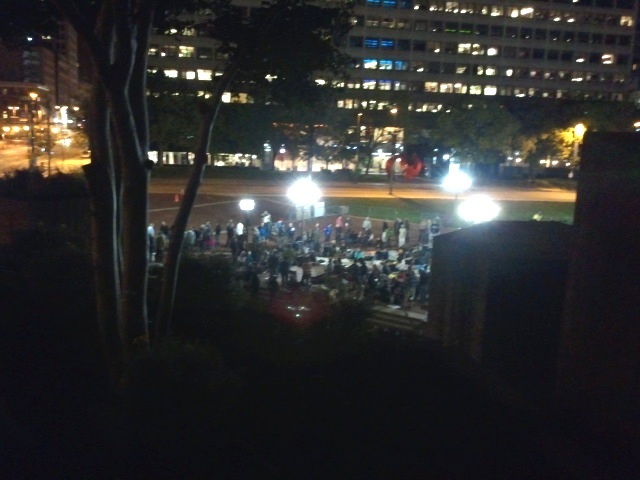 Tonight, I'm in Baltimore's McKeldin Square (Pratt and Light Streets) for the first night of Occupy Baltimore. I couldn't make it down before 10pm, and I don't know what I'll be able to do over the next few weeks; but I thought it important to be here tonight and do what I can. I went to the planning meeting at 2640 on Sunday -- there were about 200 people there. Certainly the largest meeting I've seen run by a democratic/semi-consensus model. So why am I here? I'm tired of three decades of worsening economic injustice, of the L curve getting worse and worse. I'm tired of the suppression of democracy by monied interests. I'm tired of a socioeconomic system that pretends that poverty and homelessness and lack of access to medical care is some sort of natural force, and not the result of human political decisions about how we share and allocate natural and human resources. I'm here because I want to see some economic justice, and the reinvigoration of democracy. While I'd eventually like to see the dawn of a Thoreau-ean Zenarchy, in the mean time I'd like the constitutional democratic republic they told me about in school instead of the corporate authoritarian militaristic plutocracy in which I find myself. Join us. See Occupy Baltimore or the Facebook page , or Occupy Together around the world. An American citizen who was never convicted, or even indicted, of a crime has been assassinated by the U.S. government. He is the first of a list of people personally targeted for murder by Obama in the name of "national security". The U.S. claims that Anwar al-Awlaki, a native-born American citizen, was involved with Al Qaeda, and linked him to the Fort Hood shootings and to an attempted airplane bombing. But he was not a solider or an operative, but a propagandist. He was murdered for what he said. Sure, what he said was odious -- he called for Muslims to murder any Americans they came across. That's bad. Anwar al-Awlaki was a nasty little man who advocated terrible acts. But free speech extends even to the right to call for violence, and the question of whether Al-Awlaki's speech went over the "imminent lawless action" line is not for the President to unilaterally decide, nor is it for him to impose the death penalty for such speech. Barack Obama, like George Bush before him, has claimed the authority to order American citizens murdered based solely on the unverified, uncharged, unchecked claim that they are associated with Terrorism and pose "a continuing and imminent threat to U.S. persons and interests." They're entitled to no charges, no trial, no ability to contest the accusations. Amazingly, the Bush administration's policy of merely imprisoning foreign nationals (along with a couple of American citizens) without charges -- based solely on the President's claim that they were Terrorists -- produced intense controversy for years. That, one will recall, was a grave assault on the Constitution. Shouldn't Obama's policy of ordering American citizens assassinated without any due process or checks of any kind -- not imprisoned, but killed -- produce at least as much controversy? 47 people were shot over this crazy holiday weekend, including three people killed and two cops wounded in a shooting near the West Indian Day Parade in Brooklyn. The parade often sees violence and also had fatal shootings in 2003 and 2005, but according to Police Commissioner Ray Kelly the city should not consider shutting it down -- "It's our biggest parade," he said, and because of the density of people, "you can't watch everything." Details are emerging about an NYPD spying operation that used federal money and an unusually close relationship with the CIA to put huge numbers of innocent people under scrutiny. More than 250 mosques and Muslim student groups in and around New York were spied upon by a secret squad known as the "Demographics Unit". Its targets included those from "ancestries of interest", including "American Black Muslim." (Which you and I know is a religion, not an ancestry, but apparently that's too complicated for the NYPD.) Several Muslim civil rights groups and a New York congresswoman have urged the Justice Department to investigate the NYPD for racial profiling. So, the NYPD's response to real shootings -- "you can't watch everything." Its response to the "threat" of Muslims praying and talking about politics: "get me the CIA, let's get some federal money and form a spy unit!" The New York Times printed my letter to the science editor. (Any New York friends still have Tuesday's paper around and willing to hold page D4 for my scrapbook?) They trimmed it, of course, cutting out the good parts; the original version is below. Amusing that some sort of automatic system apparently tagged "wasting" as related to muscle atrophy when they posted it to the web. I'm fairly certain that firearms safety was not part of my doctor's medical training, and if she brought the topic up at my next appointment I'd be concerned about why she was wasting time on a minor threat to my health. More than four times as many people die in fires each year than in firearms accidents, yet I don't hear anyone calling matches a "public health issue". So long as people like Dr. Marcus conflate murders and suicides by firearm with accidental deaths, people who understand the statistics will feel that they are being treated as potential murderers or suicide cases when doctors ask prying questions about firearms ownership. Firearms are just one of many potentially dangerous items in a home, and excessive focus on gun accidents reveals either ignorance of the facts or a political agenda. Read more about letter to the editor, New York Times: "Guns in the Exam Room"